Jamie, derecho in Spanish means “right”. A blow or a hit given with “mano derecha” (right hand) is heavier, more powerful and harder than the a hit given with a left hand. Perhaps the Meteorologists, counting on the fact that not many people are linguists, have come up with this Spanish word to diminish the force of the tornado and consequently not to frighten people. I’m glad someone already gave you the English translation cause I’m just now sitting down to read WordPress. FYI – left is izquierda just in case meteorologists need to name something and decide to keep using directions. Stuff like that happens here in AZ all the time. Sometimes people will slap together two Spanish words that don’t make any sense together. My favorite story my grandpa used to tell me was that when he worked for the city, they were going to name a street Borracho Street. He gently informed them that borracho meant a drunk man. This is the kind of thing I would be looking up, too … but you did such a thorough job, I won’t need to! Thank you! The weather is just crazy, isn’t it. These droughts… just awful. Today, the area of Pennsylvania where I live is supposed to get clobbered by horrible storms this afternoon. Here we go again……. Thank you Jamie. I totally agree with you about knowing facts as they are, good, bad, or frightening, without beating around the bush. Furthermore, the US is an English speaking country, why did the meteorologists feel compelled to use a word in the Spanish language? Just saying. Jamie, this is the way I see it: the US is a melting pot, but an English speaking country, that’s the way it was originated and English is the national language. All foreigners must learn the national language and speak it in public, in schools and a work to keep the nation one unity. All the foreigners can keep their original language at home and with their friends. That’s the way it is done in Europe. In schools we must learn foreign languages, as many as we can, empowering us to conduct business with the adjacent European countries and with the rest of the worlds. In Europe, every sign is written in at least 4 languages with the national language on top. I am Italian and speak 5 languages fluent and speak them anywhere it is necessary. In my home and with my friends, I speak whatever I want, but when I get on the phone to talk to the bank for ex. and I hear push #1 for Spanish and #2 for English, it irritates the hell out of me. It also irritates me greatly when some contractors bring on board of my design projects some Spanish speaking people who do not understand a word of English. The contractor do not speak Spanish and I end up translating everything for them, while I am hired by a client to do a design job. Speaking foreign languages is great, but in order for a society to function, the language must be one only. Sorry for the lengthy reply. I have not seen any reply but this one. Thank you Jamie for accepting my point of view. 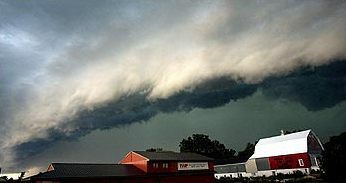 The weather changing pattern is worrisome… I’m learning the Derecho. Thank you! A really interesting post! The first time I heard the term is after the big storm in the States that knocked out all the power. Interesting article and picture for that matter. I live out in California and I am wondering how our weather is going to be in the coming months as we have surely been experiencing some very mild weather for July. With the beginning of August just around the corner and usually the hottest month of the year I am really wondering if its going to remain with these mIld temps then get slammed in our Fall months with incredible heat. You have The Derecho and I have the haboob. Nah, that wasn’t me. The local Fox station keeps telling people to upload their photos. Seems like there are a lot of people that documented this storm. I don’t know that my photos would add much- at least locally. Is that the same Coast to Coast that used to be hosted by Art Bell? My uncle used to listen to Coast to Coast all the time when Art Bell hosted. I got him started on listening to an Australian podcast -Mysterious Universe. I think he still does listen to Coast to Coast once in awhile. I never thought about submitting photos there. I thought about submitting them to the media outlet I work for, but decided to just keep them for myself :). I should – I think I might just submit my photos somewhere this week. Going to submit to The Weather Channel.